Chermoula can be bought in jars – but like most things that can be bought ready made – it’s much more fun and tasty when you make it yourself. Chermoula is a North African marinade and sauce. It tastes great and is very versatile – like a spicy salsa verde that can be used for roasting any fish and white meat. The preserved lemon gives a distinct North African flavour. It’s not at all pungent or hot or event too full of coriander. I find it is a very pleasant and balanced sauce tasting of herbs and tangy lemon, perfect for coating chicken or fish and goes well served with rice, bulgar wheat, cous cous or potatoes. Add a few more preserved lemons, black or green olives, almonds or other nuts, pomegranates or raisins to complete the regional flavour notes. 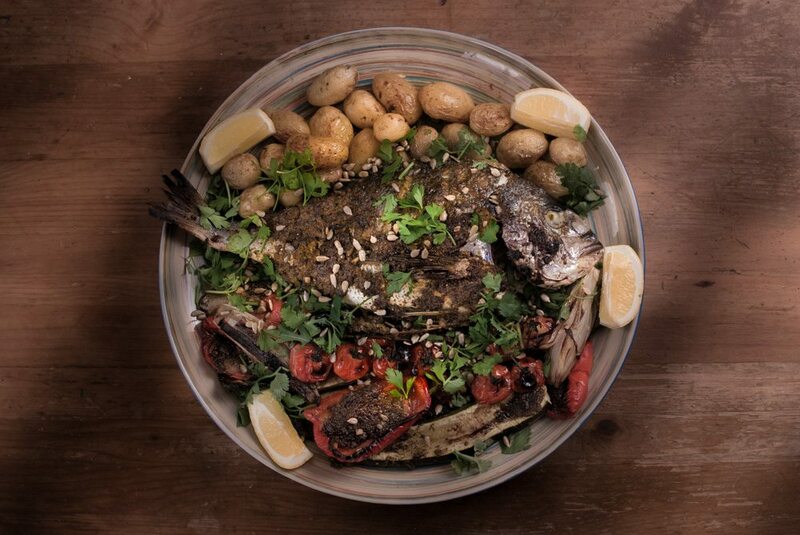 This recipe uses the chermoula as a marinade for the fish and a roasting sauce for the fish and vegetables. Chermoula works especially well on the red pepper and aubergine and makes a good partner for the fish. In fact the roasted vegetables with chermoula could be a meal on their own served over a bed of cous cous. NB: You will need to buy preserved lemons in a jar – unfortunately it is the main distinctive taste in the sauce, but you could omit and perhaps add the flesh or juice from another lemon. You can also buy ready made chermoula in jars. Toast the sunflower seeds. Heat a dry pan and toast the seeds. Set aside. Make the chermoula. First prepare the lemons, cut in quarters and cut out the flesh leaving the peel. Chop very finely. Toast the cumin and coriander in a dry pan and then grind in spice grinder or pestle and mortar with the dried chilli, paprika and saffron. Set aside. Add the garlic and salt to pestle and mortar and pound to a puree. Add the preserved lemon and the fresh parsley and coriander and continue to grind. Add the lemon juice and half the olive oil to help make the puree. Add the dry spices and then the remaining olive oil. Adjust the seasoning to taste using extra salt, pepper, sugar, preserved lemon liquid, lemon and olive oil. The mixture should be thick and smooth. Marinade the fish. Cut three deep slashes into each side of the fish and pack the chermoula into them. Cover the inside and outside of the fish with the sauce, leaving about a third of the sauce for the vegetables. Set aside in a cool place to marinate in a baking dish for half an hour. Prepare and cook the vegetables. Wash the potatoes and bring to the boil in a pan. Cook until just about tender and drain. Wash and cut the pepper in to quarters, the aubergine and courgette into thick slices and peel and cut the shallot into quarters. Wash the tomatoes. Cover all the vegetables in lightly in olive oil. Set the tomatoes aside, and place the vegetables on a roasting tray and put in the oven. They will need about an hour altogether. After half an hour, remove from the oven and ensure that the vegetables are cooking evenly and not sticking, drizzle more olive oil over the vegetables if necessary. Spoon the remaining chermoula sauce over the peppers and aubergines. Roast the fish. Put the fish in its baking dish in the oven under the vegetables. This gives the fish about half an hour to cook whilst the vegetables are finishing. Finish roasting fish and vegetables. The cherry tomatoes need about 15 minutes to roast. Add them to the vegetable tray timed to finish with the other vegetables. They look good if a little charred but the tomatoes should still hold their shape. You may find it easier to put the vegetable tray under a grill for the final cooking. Continue roasting the fish until cooked. It may benefit from being at the top of the oven or also having a final blast under a grill. Assemble the dish. Put the fish on a large platter with the vegetables. Garnish with fresh parsley and coriander, lemon, sunflower seeds and olives. Serve with a green salad.